I have been having a long battle with this pest in my Lemon Tree. It is a true infestation. I did some research and this is what it is and how to treat it with natural products. Citrus psylla is the vector and transmitter of a major citrus disease known as Greening. Citrus trees have 3 normal growth flushes during the year: spring growth during August/September, followed by a second in November/December and the last during February/March. Lemons are, however, the exception since lemon trees form new leaves throughout the year. It is during these flushes that the trees are subject to psylla infestation. It is therefore important to examine the trees thoroughly during these periods to determine the degree of infestation and to organise control of the pest accordingly. The female lays easily discernible orange-yellow eggs on the edges of young leaves. When the eggs hatch, the young nymphs move to the underside of the leaves where they establish themselves to feed and cause pock-like malformation of the leaves. Control of the pest must be aimed at destroying the nymphs as soon as possible after they have hatched. Because all the eggs do not hatch simultaneously, it is essential to use a spray with a fairly long residual action. Keep your citrus safe from pests, the most common of which is citrus psylla. 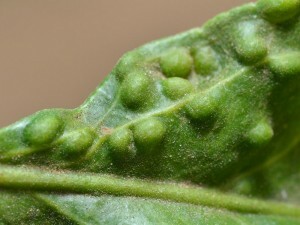 An infestation results in a swelling on the upper leaf caused by insects underneath the leaf. Citrus psylla affects mainly young trees. BIONEEM : 1500ppm AZADIRACHTIN The key insecticidal ingredient found in the neem tree is AZADIRACHTIN, a naturally occurring substance that belongs to an organic molecule class called tetranortriterpenoids. It is structurally similar to insect hormones called ‘ecdysones’ which control the process of metamorphosis as the insects pass from larva to pupa to adult. Metamorphosis requires the careful synchrony of many hormones and other physiological changes to be successful, and azadirachtin is an ‘ecdysone blocker’. It blocks the insects production and release of these vital hormones. Insects then will not moult, thus breaking their life cycle. Azadirachtin also serves as a feeding deterrent for some insects. Depending on the stage of life-cycle, insect death may not occur for several days. However, upon ingestion of minute quantities, insects become quiescent and stop feeding. Residual insecticidal activity is evident for up to seven days or longer, depending on insects and application rate. Bioneem is used to control a wide range of insects (up to 200 insect types) including white flies, leafminers, mealybugs, thrips, fruit flies, leaf hopper, red spider mite, weevils and many more. Azadirachtin is relatively harmless to insects that pollinate crops and trees, such as butterflies, spiders and bees; ladybugs that consume aphids; and wasps that act as a parasite on various crop pests. This is because neem products must be ingested to be effective. Thus, insects that feed on plant tissue succumb, while those that feed on nectar or other insects rarely contact significant concentrations of neem products. PYROL : ACTIVE INGREDIENTS : PYRETHRINS 0.5% ,CANOLA OIL 89.5% This product provides broad-spectrum control. It can be used as a dormant and growing season insect spray and kills all stages of insects, including eggs, on contact. It is a proprietary formulation consisting only of naturally occurring plant oils as active ingredients. It is truly an insecticide from plants for plants. It does not contain piperonyl butoxide as a synergist, and the active ingredients do not persist in the environment. This product will control insect pests such as : aphids, beetles (e.g., Colorado potato beetle. Flea beetle, Japanese beetle, asparagus beetle), caterpillars (e.g., gypsy moth caterpillars, tent caterpillar, diamondback moth larvae, leaf rollers), ants, mealy bugs, mites, leafhoppers, scale, whitefly, adelgids, plant bugs, fungus gnats, thrips, sawfly larvae, psyllids, spittlebugs, and phylloxera. It looks like we have to be aggressive with our attack. We might have to soak the leaves of the tree with organic pesticide and do it regularly to clear them of desease – AND give them coffee grounds! I had to eventually get rid of my ornamental naartjie tree because it was so infested. This could have infected my lemon tree. I have the exact same problem with my Lemon Tree. I really need to do something about it.